Kingdom Hearts III co-director Tai Yasue was recently interviewed by Game Informer's Kimberley Wallace during his visit at the Game Developers Conference this past week where he discussed about the difficulty level of the game as well as Final Fantasy characters and the best moments within Kingdom Hearts III. You can check out some excerpts from the interview below. THE INTERVIEW DOES CONTAIN SPOILERS, PLEASE BE ADVISED! Yasue: "There was a lot of feedback that said the standard and beginner were pretty easy. I guess, we sort of aimed for that though. For us, we wanted it to widen our audience so that was the whole point of that, but we did get a lot of [responses] saying [fans] wanted more difficult modes, so we gave them critical mode. I sort of expected that people might think that it was too easy, but we were targeting an audience. My kids, for example, who have never played Kingdom Hearts. .... We really look at what everyone is writing. We totally understand and respect that. I can't make any announcements just yet." Yasue: "We felt that it was enough. When you're playing the game, you don't want boss fights all of the time, right? We sort of paced it when we were doing the level design. We also really focused on changing the gameplay, going in our ship and going in the robots....As a gameplay designer, you don't want to have it too hard so people give up. It was a difficult balance to strike." Yasue: "That was a conscious decision. I think, for us, that was a big experiment as well. You don't see a lot of games where you can do so much as quickly. Things are usually more controlled. It's a new age, players want more stuff and we felt that our player base was changing, so we adapted to that. But for me, it was a little bit of a risk of how that would play out." Yasue: "We had a lot of original characters. 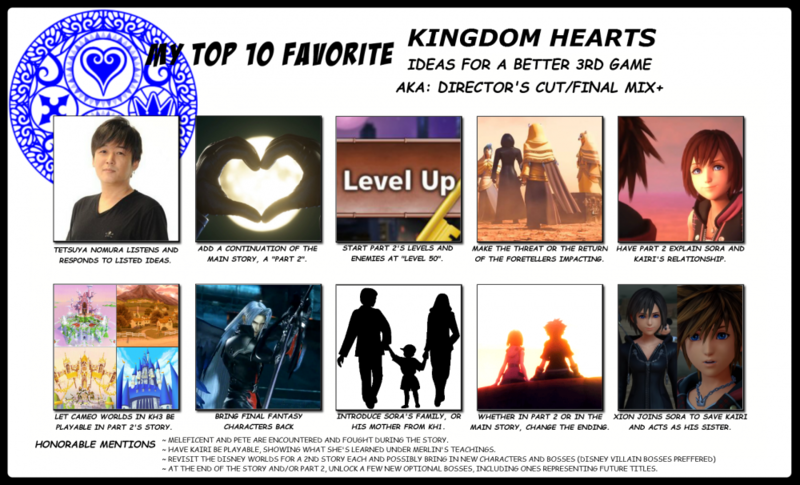 It's the conclusion of the Xehanort saga and we really wanted to concentrate on the main storyline of Kingdom Hearts, such as Sora and Roxas, for the example. They're having all these stories in other games and we wanted them to conclude." Yasue: "We changed a bit at the end. The final moment when we put the master up, we didn't have the train. I've never said this before. It came at a very late date, so that was added. 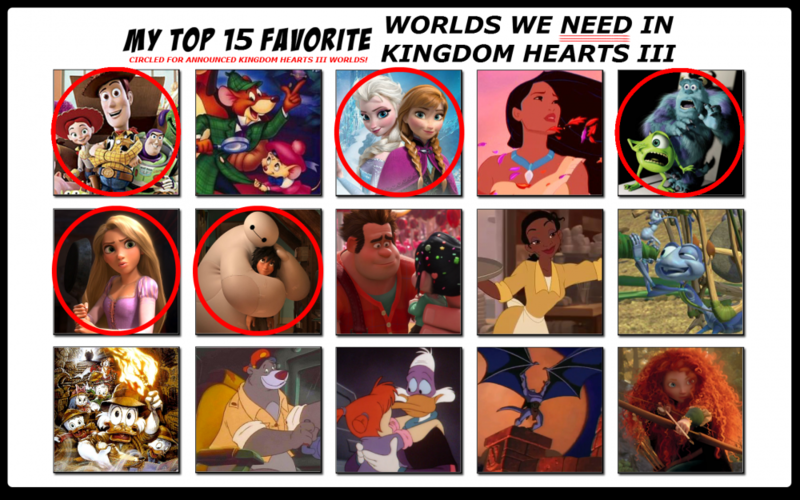 I wanted it added because I wanted something new for a Kingdom Hearts III battle. The train, you could only use it for the Rock Titan in the Hercules stage, and I thought it would be a nice conclusion if you could use it at the last moment." Yasue: "All the characters coming together, it was actually emotional for me, too. Birth By Sleep that was one of my first Kingdom Hearts games I made. 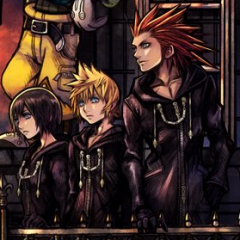 It was very sad at the end when we made [that] game because everyone gets separated (Terra, Aqua, and Ventus) and then all these years later I get to make the end for that. That moment is very special [when they meet again]. You sort of relate that with your life as well. I think that's how a lot of fans feel as well, they relate that to their lives. I didn't write the story, Nomura did, but to experience that as a player – that was very special to me." You can check out the entire interview by clicking here. 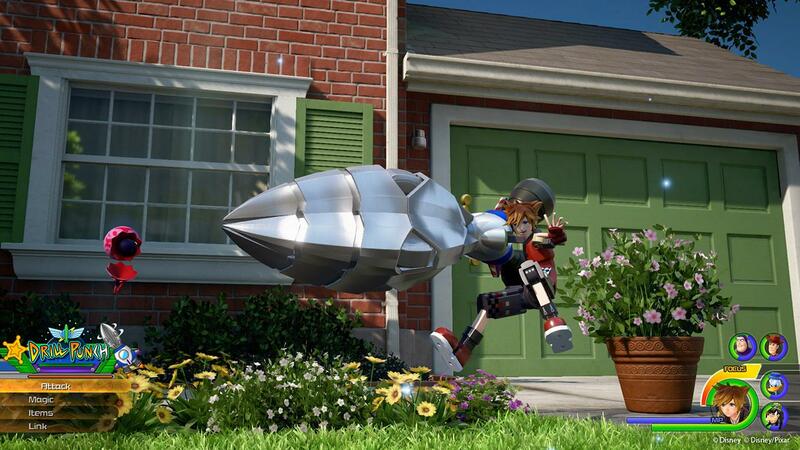 Yasue did give a hint that critical mode will be coming to Kingdom Hearts III in a comment earlier in the week, though he hasn't given much more details. What do you think of this interview? Let us know in the comments below! So he's the reason why! I love that battle but I seriously hated that conclusion! 1: I understand the reason for the easy difficulty (I'm honestly ok with it myself) but most people who have been fans since the beginning were expecting challenge. 2: Targeting an audience that has never played a KH game isn't a good idea, especially considering how complicated the story is. The memory archive isn't that accurate either. 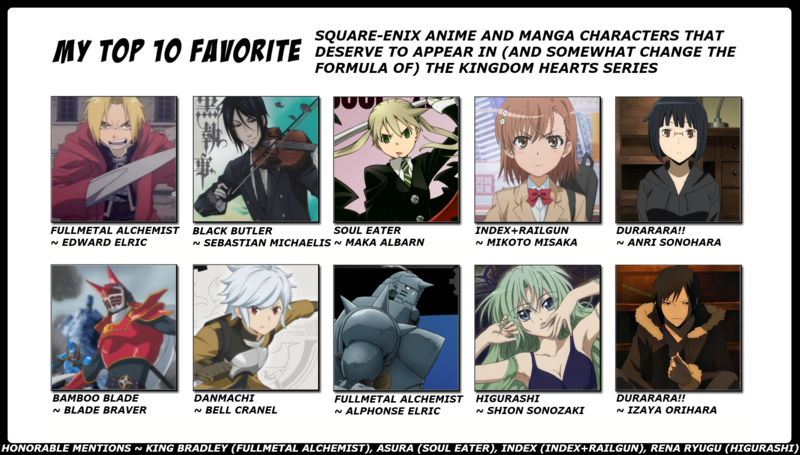 3: Just a positive comment, I live the keyblade transformations. 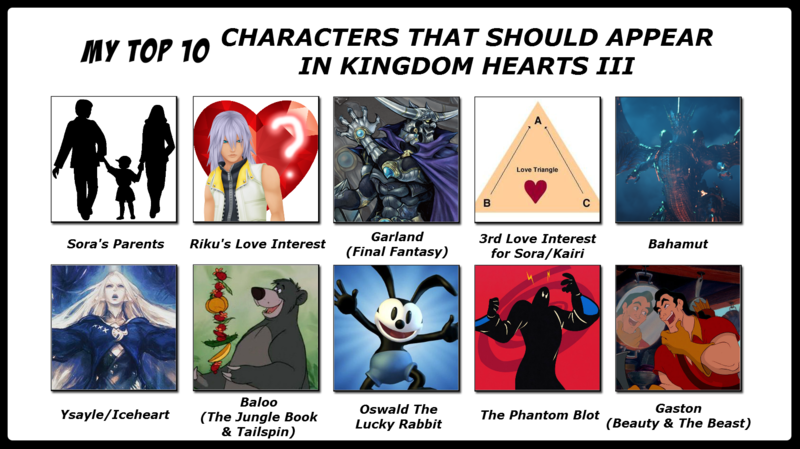 In my opinion, it adds variety to the combat and gives me a reason to use other keyblades. Probably the best addition in my opinion. 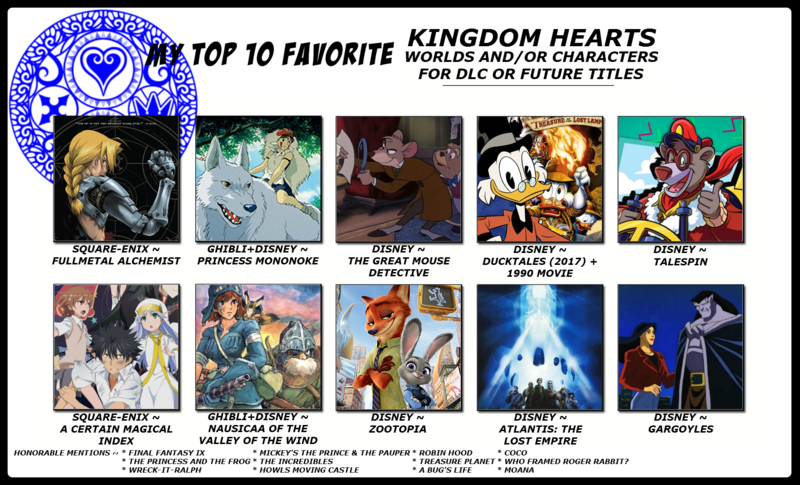 Final Fantasy characters, classic & new to the Kingdom Hearts series would still be nice, that and more story and levels. I'm pretty disappointed by the lack of promise Tetsuya Nomura made, makes me think he's screwing with his fans just like George Lucas did. I really expected more from him, but he cropped the game just like Final Fantasy XV, making it less than what it should have been, and PS: The DLC didn't help. I doubt he will in the future, but next time, make what you promised and don't make HALF of a game! Lastly, the DLC should NOT be a separate accessed story, merge them AND the expanded stories into the main game! Just hope he doesn't go down the drain like many other directors-turned-lame. Some memes didn't make sense, so I deleted a few.